The long-rumored Freddie Mercury/Queen biopic is indeed gaining traction, but the project may not satisfy those wishing for an honest portrayal of Mercury’s life and tragic death of AIDS. Borat star Sacha Baron Cohen was originally slated to play Mercury, but he left the project (dramatically, at that) after Queen band members Brian May and Roger Taylor took control. 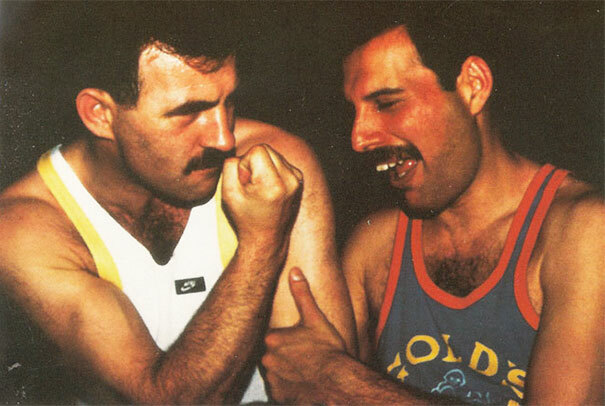 They pushed to focus the film on the glory of Queen rather than Mercury’s battle with disease. And it would seem they have gotten their wish. Out director Bryan Singer of X-Men fame is now attached to the project, which is currently titled “Bohemian Rhapsody The Film.” Mr. Robot star Rami Malek will star as Mercury. Mercury’s personal life is not included in the announcement. Both Brian May and Roger Taylor are set to be executive producers for the film. They added: “Yes folks, it IS finally happening. Award winning director Bryan Singer is the man who will be bringing the Queen and Freddie story alive. “If you’ve ever seen Singer’s X-Men films, or the groundbreaking movie The Usual Suspects, you’ll know this is a director with extraordinary imagination and style. A perfect choice to recreate the fabulous Queen years which brought us such unforgettable moments as Live Aid, which we can reveal will be faithfully recreated for a key sequence the film. More on that very soon. “Rami Malek has signed up to take on the challenging role of Freddie Mercury. Who could imagine a more perfect fit than this brilliant actor ? At this stage you probably know him best for TV’s Mr Robot. The blog adds: “QOL can also confirm that the film is now ‘as-close-as-that’ to start of shooting. Pre-production begins next week in the UK to prepare for start of principal photography in around London as soon as mid-September. Yeah, that isn’t exactly what we were wondering. Here they go again, whitewashing the real-life experiences of a famous gay person! Have we had enough depressing AIDS movies already? We all know how it ended, what benefit is there in reliving that part of his life? FM was a complicated musical genius and entertainer….tell that story. A story about Freddie Mercury that omits either Queen or his having AIDS is like a story about Liberace that fails to mention his Las Vegas stardom or his having AIDS. Either extreme is, well, extreme. Here’s a man who left his entire estate to a woman who he called the love of his life; so, yeah, he was “complicated.” Let’s hope they find a balance in how he is portrayed. Let audiences decide if there’s a big enough appetite for a movie that depicts his personal life. Wow, the trolls are out in force today. Hey, that’s a great idea, next why don’t we do a movie about Christ, but you know, without that downer of the crucifixion. Brody: I could not agree more. DCGuy: You’re an idiot. You def look in the mirror too much….you see trolls everywhere! If you’re going to pretend to be a new account try not to reference a lot of old postings somebody has done. But thanks for giving yourself away troll. DCguy: I do many things …some quite well, but being someone else aint one of them. Guess me and Mobro can agree on something,,,albeit not that often, for he can be an idiot too! Trust me, the AIDS storyline is a test trial balloon they are sending out. If they don’t get much pushback, they will also omit anything gay from his storyline. Same here, the Straight members of Queen and the usual movie suspects will pump up the other band members lives, and Mercury’s parts will ALL be about song writing or conflicts with record executives. Quick, look under your bed! You LITTERALLY used this exact same line in a previous post…the only difference was, the screename that did it was…….MoBro. Wow, you REALLY aren’t good at keeping your new troll screenames a secret are you? Yo gurl….a bit paranoid?? You “litterally” “really” need to look under the bed,… and watch out for that cat box! Interesting. I mean, they covered Eazy-E’s diagnosis and battle with AIDS in “Straight Outta Compton.” Maybe straight is the operative word. That said, I can see why they may just want to focus on the music…just make sure it’s consistent across the board and not picking and choosing. Believe it or not, Freddie Mercury was not defined by his having AIDS. He was defined by his music, and Queen, and that’s the story we want to hear. We all know how he died, and to be perfectly honest, it’s not important. Funny then that every other biopic will mention their relationships and how they died. ONLY in the case of anybody lgbt that we here this B.S. that their personal life isn’t relevant. No, “we” don’t “all know how he died,” and it’s important to tell the full story. There is nothing shameful about dying from AIDS, and it doesn’t diminish Freddie Mercury one bit to know the full story of his life. There would have been no Queen as a group without him. Straight film execs love de-gaying stories to make them more palatable to homophobes. Look at how they tried to de-gay Alan Turing, who was openly gay and cruelly tortured with hormone therapy by the British government for it! who is this DCguy? ,,,some anachronistic jive fool from the days of sisters of perpetual indulgence? Grow dude…grow!!!! @Rex Huskey. Says the idiot who just created a new screen name. Notice the goal of the troll. IT’s to take any conversation away from the attempt to whitewash or straightwash this. They are here to defend bigots, defend the closet, and work against anything that would provide visibility or push for rights for lgbts. The new screename “Rex Huskey” is not very creative when you consider an older one of Mo Bros (BJ McFrisky). He can’t even come up with anything cleverly different. Dude, you “litterally” need help…. BTW what did you find under your bed? Brian Singer directing? Really? A known multiple time sexual assaulter and general weirdo who is known to pay young men to be with him and who suddenly became bi when the assault rumors reached a peak and when he wanted to have a child and who hasn’t made a decent movie since the mid-90’s? And of course, no mention of AIDs. Hell, they’ll probably even barely acknowledge his orientation. Typical twisted, self-hating Hollywood garbage. Also, yes, you can tell the story of Queen the band and include Mercury’s actual life. It doesn’t have to be another sad AIDS story. But let’s be real. People are interested in seeing a movie about Freddie Mercury not Queen the band. My understanding is that it is going to end with their Live Aid performance, which probably happened before he even contracted HIV. This is just more fake outrage, it seems pretty clear that this film is meant to be the story of Queen, not Freddie. Just because the gay media insists on referring to it as a Freddie Mercury biopic doesn’t mean it was ever actually a Freddie Mercury biopic.